You can use Media Services to deliver HTTP Live Streaming (HLS) and Smooth Streaming encrypted with the AES by using 128-bit encryption keys. Media Services also provides the key delivery service that delivers encryption keys to authorized users. If you want Media Services to encrypt an asset, you associate an encryption key with the asset and also configure authorization policies for the key. When a stream is requested by a player, Media Services uses the specified key to dynamically encrypt your content by using AES encryption. To decrypt the stream, the player requests the key from the key delivery service. To determine whether the user is authorized to get the key, the service evaluates the authorization policies that you specified for the key. Media Services supports multiple ways of authenticating users who make key requests. The content key authorization policy can have one or more authorization restrictions, either open or token restrictions. The token-restricted policy must be accompanied by a token issued by a security token service (STS). Media Services supports tokens in the simple web token (SWT) and JSON Web Token (JWT) formats. For more information, see Configure the content key's authorization policy. To take advantage of dynamic encryption, you need to have an asset that contains a set of multi-bitrate MP4 files or multi-bitrate Smooth Streaming source files. You also need to configure the delivery policy for the asset (described later in this article). Then, based on the format specified in the streaming URL, the on-demand streaming server ensures that the stream is delivered in the protocol you selected. As a result, you need to store and pay only for the files in single storage format. Media Services builds and serves the appropriate response based on requests from a client. This article is useful to developers who work on applications that deliver protected media. 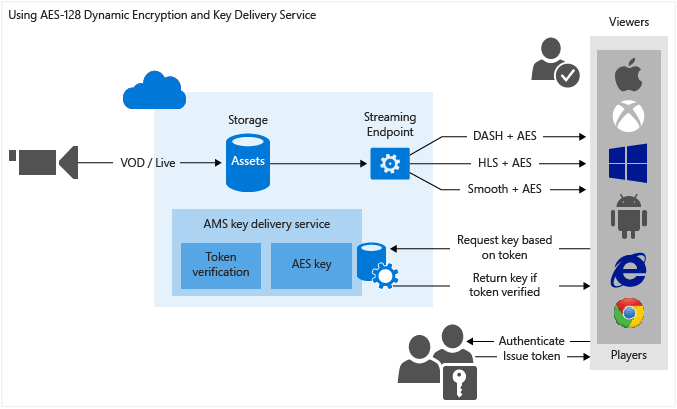 The article shows you how to configure the key delivery service with authorization policies so that only authorized clients can receive encryption keys. It also shows how to use dynamic encryption. For information on how to encrypt content with the Advanced Encryption Standard (AES) for delivery to Safari on macOS, see this blog post. For an overview of how to protect your media content with AES encryption, see this video. Create an asset, and upload files into the asset. Encode the asset that contains the file to the adaptive bitrate MP4 set. Create a content key, and associate it with the encoded asset. In Media Services, the content key contains the asset's encryption key. Configure the content key's authorization policy. You must configure the content key authorization policy. The client must meet the policy before the content key is delivered to the client. Configure the delivery policy for an asset. The delivery policy configuration includes the key acquisition URL and an initialization vector (IV). (AES-128 requires the same IV for encryption and decryption.) The configuration also includes the delivery protocol (for example, MPEG-DASH, HLS, Smooth Streaming, or all) and the type of dynamic encryption (for example, envelope or no dynamic encryption). You can apply a different policy to each protocol on the same asset. For example, you can apply PlayReady encryption to Smooth/DASH and an AES envelope to HLS. Any protocols that aren't defined in a delivery policy are blocked from streaming. (An example is if you add a single policy that specifies only HLS as the protocol.) The exception is if you have no asset delivery policy defined at all. Then, all protocols are allowed in the clear. Create an OnDemand locator to get a streaming URL. The article also shows how a client application can request a key from the key delivery service. You can find a complete .NET example at the end of the article. The following image demonstrates the workflow previously described. Here, the token is used for authentication. The remainder of this article provides explanations, code examples, and links to topics that show you how to achieve the tasks previously described. If you add or update your asset's delivery policy, you must delete any existing locator and create a new locator. To manage, encode, and stream your videos, you must first upload your content into Media Services. After it's uploaded, your content is stored securely in the cloud for further processing and streaming. For more information, see Upload files into a Media Services account. With dynamic encryption, you create an asset that contains a set of multi-bitrate MP4 files or multi-bitrate Smooth Streaming source files. Then, based on the specified format in the manifest or fragment request, the on-demand streaming server ensures that you receive the stream in the protocol you selected. Then, you only need to store and pay for the files in single storage format. Media Services builds and serves the appropriate response based on requests from a client. For more information, see Dynamic packaging overview. When your Media Services account is created, a default streaming endpoint is added to your account in the "Stopped" state. To start streaming your content and take advantage of dynamic packaging and dynamic encryption, the streaming endpoint from which you want to stream content must be in the "Running" state. Also, to use dynamic packaging and dynamic encryption, your asset must contain a set of adaptive bitrate MP4s or adaptive bitrate Smooth Streaming files. For instructions on how to encode, see Encode an asset by using Media Encoder Standard. In Media Services, the content key contains the key that you want to encrypt an asset with. For more information, see Create a content key. Media Services supports multiple ways of authenticating users who make key requests. You must configure the content key authorization policy. The client (player) must meet the policy before the key can be delivered to the client. The content key authorization policy can have one or more authorization restrictions, either open, token restriction, or IP restriction. For more information, see Configure a content key authorization policy. The initialization vector (IV) to use for the envelope encryption. AES-128 requires the same IV for encryption and decryption. The asset delivery protocol (for example, MPEG-DASH, HLS, Smooth Streaming, or all). The type of dynamic encryption (for example, AES envelope) or no dynamic encryption. For more information, see Configure an asset delivery policy. You need to provide your user with the streaming URL for Smooth Streaming, DASH, or HLS. For instructions on how to publish an asset and build a streaming URL, see Build a streaming URL. Get a test token based on the token restriction that was used for the key authorization policy. // back into a TokenRestrictionTemplate class instance. // Generate a test token based on the data in the given TokenRestrictionTemplate. //so you have to add it in front of the token string. You can use the Azure Media Services Player to test your stream. How can your client request a key from the key delivery service? In the previous step, you constructed the URL that points to a manifest file. Your client needs to extract the necessary information from the streaming manifest files to make a request to the key delivery service. In the case of HLS, the root manifest is broken into segment files. For example, the root manifest is: http://test001.origin.mediaservices.windows.net/8bfe7d6f-34e3-4d1a-b289-3e48a8762490/BigBuckBunny.ism/manifest(format=m3u8-aapl). It contains a list of segment file names. If you open one of the segment files in a text editor (for example, http://test001.origin.mediaservices.windows.net/8bfe7d6f-34e3-4d1a-b289-3e48a8762490/BigBuckBunny.ism/QualityLevels(514369)/Manifest(video,format=m3u8-aapl), it contains #EXT-X-KEY, which indicates that the file is encrypted. If you plan to play an AES-encrypted HLS in Safari, see this blog. // AES keys must be exactly 16 bytes (128 bits). Set up your development environment, and populate the app.config file with connection information, as described in Media Services development with .NET. Overwrite the code in your Program.cs file with the code shown in this section. There is a limit of 1,000,000 policies for different Media Services policies (for example, for Locator policy or ContentKeyAuthorizationPolicy). Use the same policy ID if you always use the same days/access permissions. An example is policies for locators that are intended to remain in place for a long time (non-upload policies). For more information, see the "Limit access policies" section in Manage assets and related entities with the Media Services .NET SDK. Make sure to update variables to point to folders where your input files are located. // A Uri describing the issuer of the token. // Must match the value in the token for the token to be considered valid. // The Audience or Scope of the token. // TokenClaim.ContentKeyIdentifierClaim in during the creation of TokenRestrictionTemplate. // (with open authorization policy). // Paste the URL and click the Update button to play the video. // In this case "H264 Multiple Bitrate 720p" preset is used. // Associate the key with the asset. var assetFile = asset.AssetFiles.Where(f => f.Name.ToLower(). // You cannot create a streaming locator using an AccessPolicy that includes write or delete permissions. // Create a URL to the manifest file.